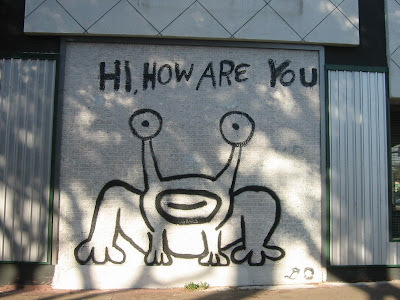 Depicted above is the (somewhat) famous "Hi, How Are You" frog mural done by Daniel Johnston on the side of a building in Austin, Texas. Originally, the building whose brick exterior played host to this mural was Sound Exchange, a now defunct record store at the corner of Guadalupe and 21st Street. However, like so many familiar Austin haunts from the 1990s, Sound Exchange folded in 2003, and the space was purchased shortly thereafter by a franchise of the Baja Fresh chain of Mexican restaurants. The question: What was to become of the mural? The community mounted a grass roots protests to preserve the mural, which had initially been threatened with destruction. Well, as you can see from the photograph above, the new owner, after some level of controversy regarding the mural's fate, built around the mural, preserving it for all to see. (In fact, according to this 2004 press release, the owner did it at his own expense.). 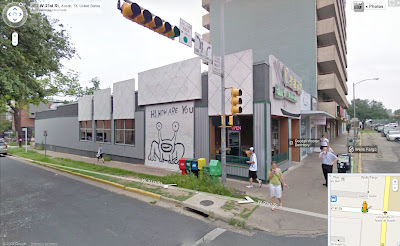 By 2008, though, the Baja Fresh chain had folded, and now at that location is Crave Thai and Sushi Bar (which likely did not face any controversy because the previous owner had already spent the money to preserve the mural). I myself must have walked by that mural dozens and dozens and dozens of times in the 1990s, even before arriving in that city for college. (Even in high school, when I would visit Austin, I would always hit Sound Exchange, Inner Sanctum, and Tower Records, all of which are now gone). I remember reading about the controversy in 2004, and I wondered then how well the community would support the chain restaurant that had ponied up the money to preserve it. These days, though, the mural of a relic of an Austin which no longer exists, but for in the minds of its current (and former) citizens who are at least a decade older than the undergraduates who walk past it every single day. A funny aside: Years and years later, long after I had left Austin, I was walking down the street in another state which I was visiting on business. Some young hipster hands me his first generation iPhone (which was then new) and asks that I take a photograph of he and a scruffy fellow standing somewhat near him. I look at the man, and it is none other than Daniel Johnston. I took the photograph and went along my merry way. 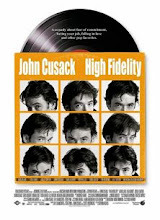 I later learned that he and his band were playing a local venue in that city that night. For more on the mural, and its history, see here, here, and here. Above: A view of the mural from Google Maps Street View. (Click to enlarge). Discussing the rise and fall of Baja fresh and Baja-style Mexican food in the heart of Texas/ Tex-Mex country is, perhaps, an interesting question. 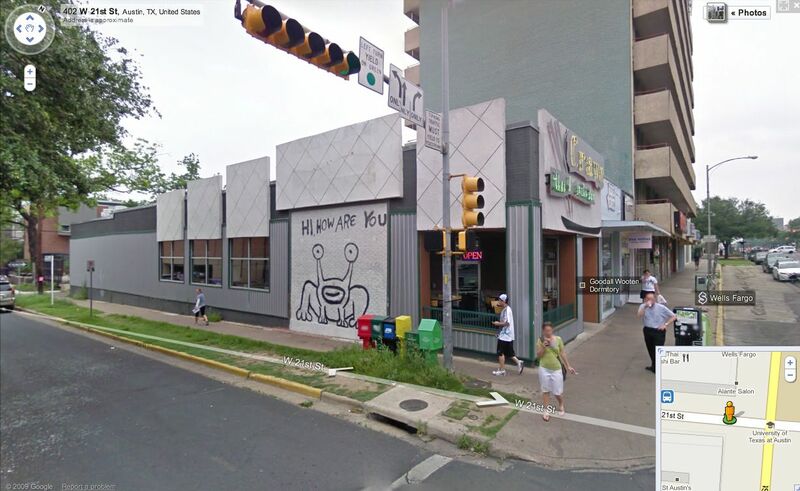 While the memory of the frog portrait could have disappeared with the ever-churning student population, instead, practically nobody really remembers Baja Fresh was in that location. And I eat at that Crave Thai restaurant fairly regularly. Its good, but skip the spring rolls. The interesting thing to me is that the community activism worked; the corporation was convinced to preserve the mural (at its own expense, which it didn't have to do). Presumably, it did so not out of a love for Johnston but out of a realization that it was what the community wanted and that to fail to do so may cost them some business. Fair enough. A cool move, particularly considering the cost. But then, the community did not support that business, either because they no longer cared once the mural was preserved (or perhaps because the food was not sufficiently tasty or there were too many Tex-Mex alternatives in Austin, Texas). But you would think that the community would at least attempt to support someone who did something like that to preserve the mural. Oh, well. Its that problem of the constant amnesia and lack of institutional memory when it comes to serving students. I agree that the guy got the raw deal in this particular case. However, you can be sure that practically every other artifact on The Drag has been painted over or redeveloped, as has most of Austin. my wife and I made it by the mural for the 1st time yesterday. As you can see from the pics on my blog, some idiot has defaced it. Whose expense will it be to repair that? Will we lose that "famous" mural that even t-shirts have been made of? I'm going to austin for the first time in October, Is this still there?? ?